Microwave at MEDIUM (50%) 10 to 15 seconds or until peanut butter cups have softened. 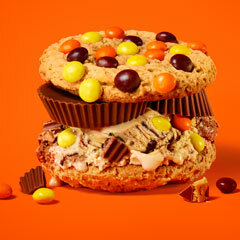 Immediately top peanut butter cups with 1/2 cup Breyers® 2in1 REESE'S® REESE'S® PIECES. Gently press second cookie on ice cream to form sandwich. Garnish, if desired with REESE'S Pieces. Serve immediately.